As they say, the show must go on. 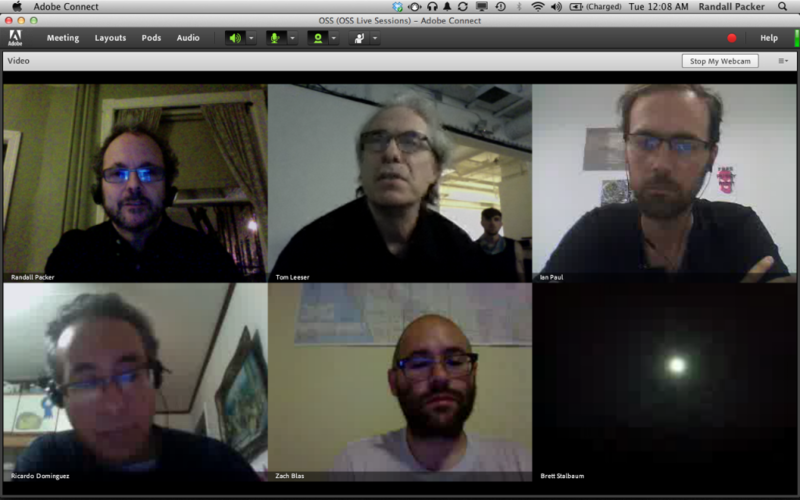 Last night, despite the oncoming onslaught of Hurricane Sandy, I hosted net artist/activist Ricardo Dominguez, along with his collaborators Brett Stalbaum, Zach Blas, and Ian Paul via video-conference, as part of the CalArts Center for Integrated Media lecture series. Camped out at the Tabard Inn (with its backup generators) here in rain swept Washington, DC, I was determined not to let the biggest storm in the history of mankind get in the way. And despite the fact that Ricardo was up in Ithica, New York where the eye of the storm was scheduled to bear down on Cornell University at exactly the time of the broadcast, the power never failed, the Internet hummed away, and the students at CalArts (where the weather was balmy and mild last night) never missed a word. Just to add another layer of the unexpected – and the poetic – Brett Stalbaum was situated in the vast emptiness of the Borrego Springs desert, in an area of rare cel reception known as the “phone booth.” Brett propped up his Android phone, pointed it at the desert full moon, and joined us in our conversation concerning net performance, tactical media, zombie culture, and the poetics of activism and artistic mediation. What a night! We have been setting up re-education camps, we call them universities. These remarks beg the following questions: What is the role of the artist in society? What is the role of the university? Do artists, scholars and educators have the freedom to carry out their work within the educational system without condemnation and without accusation of corrupting innocent students? Does the 1st amendment no longer apply (when it comes to artists) within the walls of academia, or even society at large? The artist tends now to move from the ivory tower to the control tower of society. Artist/activists such as Ricardo Dominguez and his collaborators recognize that the artist never takes no for an answer, the artist refuses the limitations of the status quo, the artist doesn’t balk at a hurricane or the emptiness of the desert, the artist takes command of the situation as a provocateur and embraces the challenge of seeking reason and change. And of course the poetics of the full moon.